Uncategories Who Is Behind Tahir Ul Qadri Movement? Last month we seen that controversial religious leader of Minhaj Ul Quran Dr Tahir Ul Qadri came back to Pakistan from Canada after a long time and announced to start a movement against Corrupt political system in his Jalsa at Minar E Pakistan Lahore. 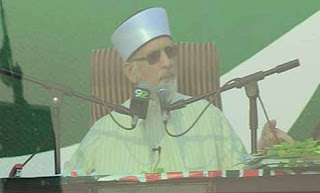 Tahir Ul Qadri also announced that a long march will be done towards Islamabad if reforms are not made until 14 January 2013. Muttahida Qaumi Movement MQM which is also an ally of PPP Government also announced to support Movement of Dr Tahir Ul Qadri. Tahir Ul Qadri is now a Canadian citizen and was living in Canada from many years but now when Elections are just few months away in Pakistan he has came back and started a so-called movement of change? Lot of people are asking this question who is behind Tahir Ul Qadri? why he has suddenly came back and started this movement? what is his agenda? According to Journalist Najam Sethi the American and British Governments are supporting him. These Governments are also giving him funds for his movement. the reason for this is that American and British Government are tired of Zardari and Nawaz Government and they don't want them to comeback again in next elections. Some people are claiming that its Establishment who is Supporting Tahir Ul Qadri to bring Martial Law. according to Tahir Ul Qadri no foreign Government or Agency is supporting him and he is doing it only for positive change in Pakistan.